You forgot to go to the store. Ugh. You forgot to stop by the store on the way home from work. So you’ll either have to make magic with what’s left in the fridge (half of a jar of pickles, some old cheese, and an onion) or you’ll have to order pizza. And since pickle, cheese and onion soup doesn’t sound good to anyway and pizza sounds good to everyone, it’s probably best to order the pizza. When you order it from the best Loveland pizza delivery, you’ll have a piping hot pizza at your door in no time. You don’t even have to fight the crowds at the grocery store to get it! It’s been a long day at work. It’s tough to come home from a long day at work and then think about what to fix for dinner. If you didn’t do any planning ahead, your options will be limited, too. You’ve burned all your mental energy in 14 meetings today, answering 200 emails, and trying to do your actual job in between all of that. So the last thing you want to do when you get home is to start defrosting something and trying to remember how many teaspoons are in a cup. When you order a pizza, you can sit down and relax until it arrives. If you can convince your family to eat it straight out of the box, there won’t even be any dishes to do afterward. You don’t have to talk to anyone. Look, sometimes it’s just too much effort to talk to another human being today. Thankfully you can order the best Loveland pizza delivery online instead. Simply head over to our website and pick out all the tasty treats you want to eat tonight. Pay online and we’ll get to work making your pizza and getting it to your house as soon as possible. We promise our delivery team is super friendly, too, and they won’t be offended if you don’t want to hang out and chat. They understand that sometimes you just need pizza, not conversation. It’s time to celebrate summer. Summer has finally arrived! If that’s not a reason to celebrate, we don’t know what is. The kids are out of school and now it’s time to be creating lots of great family memories together. That doesn’t involve cooking dinner. It does involve pizza parties in the backyard, eating pizza while watching movies together and maybe even eating cold leftover pizza for breakfast. It’s summer, after all, so it’s time to relax and cut loose. Celebrate the arrival of this special season by ordering some delicious pizza for the entire family tonight. There really is no better reason than this one! Pizza is the best. It’s warm, cheesy, and topped with all the best ingredients. 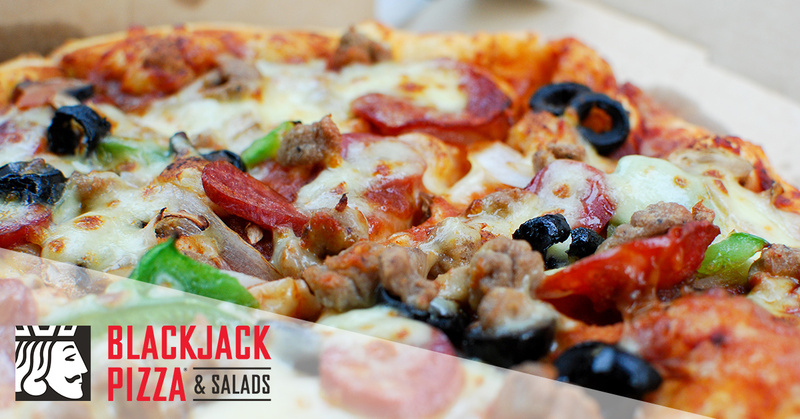 It’s even better when you order it from Blackjack, the best Loveland pizza delivery around. Whether you are ordering pizza to celebrate, because you are too tired to cook, or don’t have anything in the fridge, you know that when your pizza arrives it’s going to be hot and delicious. Don’t worry about finding an excuse to order pizza! You don’t really need one. Just pick up the phone and give us a call and we’ll be on our way with your pizza in no time!